More and more of today’s numerical problems found in engineering and finance are solved through Monte Carlo methods. The heightened popularity of these methods and their continuing development makes it important for researchers to have a comprehensive understanding of the Monte Carlo approach. 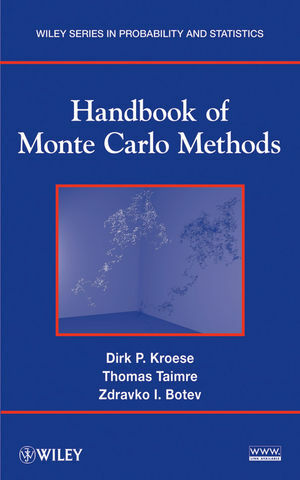 Handbook of Monte Carlo Methods provides the theory, algorithms, and applications that helps provide a thorough understanding of the emerging dynamics of this rapidly-growing field. The presented theoretical concepts are illustrated with worked examples that use MATLAB®, a related Web site houses the MATLAB® code, allowing readers to work hands-on with the material and also features the author's own lecture notes on Monte Carlo methods. Detailed appendices provide background material on probability theory, stochastic processes, and mathematical statistics as well as the key optimization concepts and techniques that are relevant to Monte Carlo simulation. Handbook of Monte Carlo Methods is an excellent reference for applied statisticians and practitioners working in the fields of engineering and finance who use or would like to learn how to use Monte Carlo in their research. It is also a suitable supplement for courses on Monte Carlo methods and computational statistics at the upper-undergraduate and graduate levels. Dirk P. Kroese, PhD, is Australian Professorial Fellow in Statistics at The University of Queensland (Australia). Dr. Kroese has more than seventy publications in such areas as stochastic modeling, randomized algorithms, computational statistics, and reliability. He is a pioneer of the cross-entropy method and the coauthor of Simulation and the Monte Carlo Method, Second Edition (Wiley). Thomas Taimre, PhD, is a Postdoctoral Research Fellow at The University of Queensland. He currently focuses his research on Monte Carlo methods and simulation, from the theoretical foundations to performing computer implementations. Zdravko I. Botev, PhD, is a Postdoctoral Research Fellow at the University of Montreal (Canada). His research interests include the splitting method for rare-event simulation and kernel density estimation. He is the author of one of the most widely used free MATLAB® statistical software programs for nonparametric kernel density estimation. 8.3 Estimation of Steady-State Performance Measures. 10.5 Cross-Entropy Method for Rare-Event Simulation. 12.5 Cross-Entropy Method for Optimization. 12. 6 Other Randomized Optimization Techniques. 13.2 Cross-Entropy Method for Estimation. 13.3 Cross-Entropy Method for Optimization. 14.3 Splitting for Static Rare-Event Probability Estimaton. 17. 1 Connections Between Stochastic and Partial Di_erential Equations.